That’s no different for this year’s Winter Games, which opened on Friday in Pyeongchang, South Korea. The event is an undertaking that costs billions of dollars and includes an NBC telecast that stretches across several weeks and time zones. Some of the staggering numbers behind this year’s games tells the story of an event that is constantly trying to outdo itself. NBC is pulling out all the stops and sending the most-ever number of commentators to provide insight and commentary for a record 2,400 hours of coverage. February 9th, 2018 — Date of the Pyeongchang Winter Olympics opening ceremony. February 25th, 2018 — Date of the Pyeongchang Winter Olympics closing ceremony. $10 billion — The estimated cost of the Pyeongchang Winter Olympics. The amount is roughly the GDP of Madagascar. 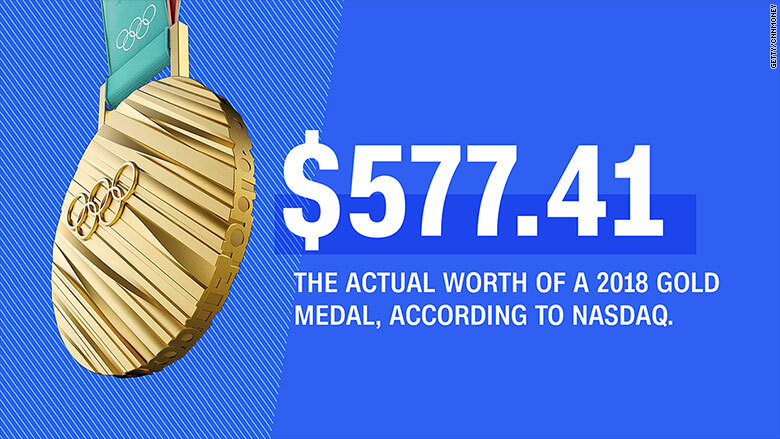 That’s five times less than the 2014 Sochi Olympics, which was estimated to be the costliest ever. 2,925 — Number of athletes who will compete in the games. The US is sending 244 athletes, the largest athlete delegation in Olympic Winter Games history. 39 — The age of the oldest US winter Olympian: Hockey player, Brian Gionta. Last year, he played his 1000th game in the NHL. 50 – Miles the city of Pyeongchang is from the demilitarized zone that separates the south from North Korea. The DMZ is a border that splits the country in two, it’s heavily fortified and is roughly 160 miles long. 5 — NBCUniversal networks that will broadcast the games (NBC, NBC Sports Network, CNBC, USA and the Olympic Channel). $900+ Million — Money generated in national ad sales for Pyeongchang, which is a Winter Games record. NBC Universal said that it expected its Super Bowl LII coverage to generate $500 million in ad revenue. 2,000 — Number of NBC employees working in Pyeongchang for the games. 2,400+ — Hours of game coverage. This is the most ever for a Winter Olympics, according to NBC. The last Winter Games to hold this record was the 2014 Sochi Winter Olympics. 127 — Miles of cable that will be used by NBC for the games. That’s roughly the distance between Los Angeles and San Diego. For the exceptionally athletic, you’d have to run the length of Manhattan roughly nine times to hit 127 miles. 126+ — NBCUniversal’s coverage hours, per day. The network said that’s nearly triple the entire coverage of the 1976 Innsbruck Winter Olympics on ABC (43.5 hours). 89 — Number of NBC Olympics commentators. The most-ever for a Winter Olympics, according to NBC. That includes Mike Tirico in his first go as Olympics host, former Olympians like skier Bode Miller, figure skaters Tara Lipinski and Johnny Weir, and Katie Couric, who makes her return to NBC to co-host the opening ceremony with Tirico. 54 — Years since NBC’s first Olympic broadcast, which was the 1964 Tokyo Games. NBC’s Olympics contract runs through 2032. 17 — Studios and control rooms used for NBC Olympics’ coverage in both Pyeongchang and NBC Sports’ home base in Stamford, Connecticut. 99 — Shipping containers full of NBC gear that traveled to Pyeongchang. The containers are full of sets, cameras and other supplies. 2 — Helicopters that will provide aerial footage. NBC plans to use the helicopters for shots of Pyeongchang and other outdoor events. 100 — Roughly the number of NBC staffers who went straight from the Super Bowl to the games. 85 — Number of robots reportedly placed in venues to provide information on schedules, transportation and tourist attractions during the Olympics. 110,000 — The amount of condoms reportedly distributed for the athletes at the games. That’s roughly 37 condoms per person. 895 — Number of days until the next Summer Olympics in Tokyo, Japan (July 24, 2020). 1455 — Number of days until the next Winter Olympics in Beijing, China (February 4, 2022).